Retrieving Trial Champion Firefield Yankee Belle - Tess was born on 19 January 1992 and retired from trialling on 4 November 2002 at the Tasmanian Retrieving Trial Championship, two months short of the age of eleven. Tess was proudly trialled by Kate and Noel Eltringham and handled by Noel. Tess was bred by Mr Barry Baker and Mr Geoff Cole. Tess’ retrieving trial career commenced on 13 June 1993 at a Novice Stake conducted by the Labrador Retriever Club of South Australia conducted at Tolderol. At her first trial outing, Tess gained second place in Novice and then went on to win the Novice Stake the following day. Tess gained her Novice Retrieving Dog title by winning a Novice Stake conducted by the Weimaraner Club of Victoria at Scarsdale conducted on 3 October 1993. Tess was campaigned sparingly in Restricted Retrieving Trials, only competing in three for two second placings and one third. 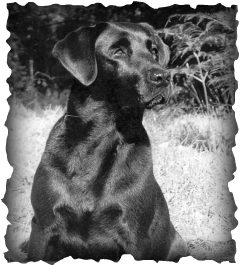 Tess ultimately gained her Restricted Retrieving Dog Title by winning an All Age Stake on 13 May 1995 in a field of thirteen dogs. It did not take Tess long to gain her Retrieving Trial Champion Title, gaining two wins in All Age Stakes at the Retrieving and Field Trial Club of South Australia, Meningie Cup Trial weekend on 8 and 9 July 1995 in fields of 17 and 18. Tess ultimately went on to win 20 All Age Stakes, place second 28 times and third 10 times. In Championship Stakes, Tess won two State Retrieving Trial Championships and came third twice. Tess also ran second in the National Retrieving Trial Championship conducted by the Royal NSW Canine Council on 11 - 13 September 1998 and judged by John Palmer and the late Peter Halford. In total, Tess gained a total of 150 championship points from her competition in All Age, State and National Retrieving Trial Championships. Tess was awarded a Certificate of Merit in an All Age Trial judged by Georgina Golle and conducted by the Central Highlands Working Gundog Club at the Easter Trial on 24 April 2000. Of Tess’ descendants, there is one National Retrieving Trial Champion – Nat. and GR RT Champion Coalsgarth Tassie Fern (“Fern”) and two Grand Champions, Fern and GR RT Champion Reveirter Jet Kite (“Tike”). Tess’ descendants to date, include 12 Retrieving Trial Champions, another 12 dogs which have gained the title of Restricted Retrieving Dog and other descendants which have gained the title of All Age or Novice Retrieving Dog. Many of these dogs are still trialling, are young and have the potential to gain higher level titles over time.